Chances are, you have had a bad night’s sleep at least once in your life. I recently came to understand the definition of “sleep deprived” once I became a mom. I have had my fair share of sleepless nights and caffeine filled days while embracing motherhood. Now that is not to say the joy my child brings has not made all of these sleepless nights worth it because being a mom is the most rewarding role I have ever been given. Do you think that my beautiful baby girl understands my need for sleep or a thinks she needs a schedule? I’m pretty sure she sees nothing wrong with keeping me up at night, hey – its playtime, right? Wrong. I need sleep. I’ve always been someone that didn’t function that well on very little sleep. Thankfully, a little over 7months later, our family is finding a schedule and finally getting back to better sleep. It’s not easy, I have had to adjust, and try to find ways to turn my mom brain off at night. Is she okay? I can’t hear her, should I get up? Trying to sleep restfully and not feel a need to check on her after so many nights together has been a challenge. As a working mom, I find success and balance in a routine. This has been the key for my family. We created routines and we follow them, for my daughter, I follow the three B’s, bath, book, and bedtime. We start at the same time each night, the repetition helps her know it’s time for bed, the consistency keeps my husband and me on track. Everyone knows the expectations each day and helps us get to bed at a reasonable hour. Without my routine, I don’t think I would find time for sleep. Yes, I am talking about the sun in a sleep article! 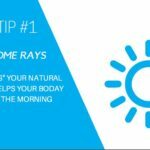 The sun “sets” your natural clock and helps your body to wake up naturally in the morning. To feel more refreshed open the blinds and let in the natural light in the mornings. Are you reaching for coffee after 2pm? 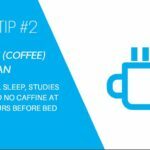 Studies show you should limit your caffeine intake 6 hours before bedtime. What about a nightcap? Not so fast. Alcohol can actually keep you awake as the sugars break down. When’s the last time you had water? 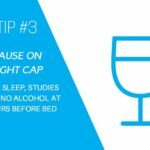 Increasing your water intake throughout the day allows your body to produce melatonin at night, a hormone that helps you sleep. To stay hydrated aim for 6-8 glasses of water a day. You read that right. 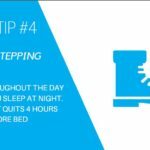 Get moving to get to sleep. Do you ever find yourself exhausted after sitting all day long? Exercise will wear you out and reset your body – just avoid working out about 4 hours before bedtime. Speaking of bedtime- set one! Your parents were on to something when they gave you a strict bedtime growing up. 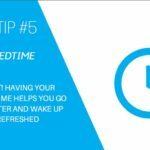 Having a regular bedtime not only helps you get to sleep faster it allows you to wake up refreshed and ready for the day. Use your smartphone to remind you its bed time, Apple has a bedtime alarm and Android has multiple apps to choose from that support sleep health. Keep it cool when it’s time to tuck in. 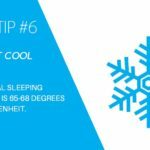 The ideal sleeping temperature is 65-68 degrees Fahrenheit. With a lowered thermostat you will not only sleep better but save money on your electricity or gas bill too. The lights from phones, tablets, and TVs stimulate the brain. 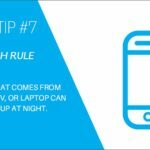 Shutting down electronics allows you to “turn off” your brain and prepare for a restful night’s sleep. If you happen to wake during the night, don’t reach for your phone – those lights will keep you up. Try counting sheep instead. Which tip(s) have worked for you? Do you have a hard time turning off at night or falling asleep? 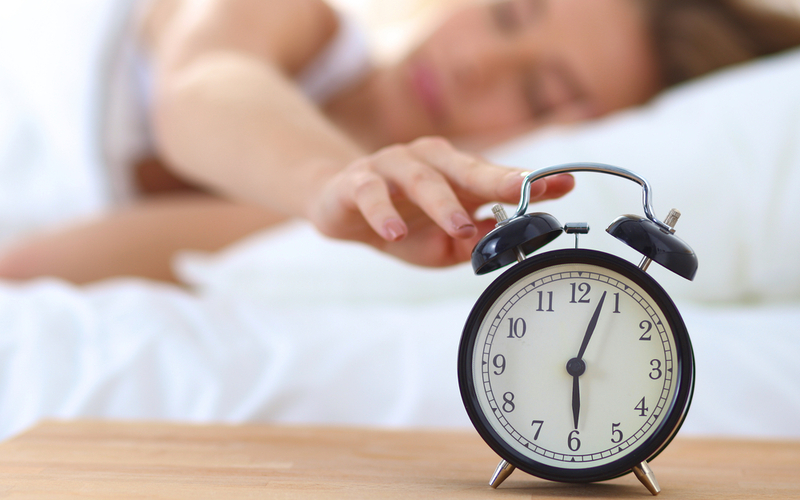 Try one of the tips this week to drift off to sleep faster. Let us know what works for you in the comments! Andrea Galloway Smith is a Client Wellness Program Manager at Blue Cross and Blue Shield of North Carolina. She believes you should live each day to the fullest. Outside of work, she loves to travel, run and spend time with her husband, little girl, and two dogs.